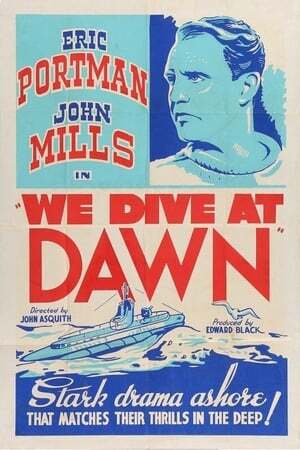 A gripping tale of WWII naval warfare in the Baltics, starring John Mills as Lt. Freddie Taylor, a British submarine Captain. The crew of the Sea Tiger are summoned from leave on shore with their families, and sent on a secret mission to intercept the Nazi battleship Brandenburg. In the ensuing battle the British submarine is damaged by a German destroyer. The submarine is leaking fuel so badly that the crew won't be able to make it back to Britain before running out somewhere along the Danish coast. When it seems that their only option may be to blow up the submarine and try to escape to Denmark, seaman James Hobson (Eric Portman) hatches a plan...Working from a well constructed script, Anthony Asquith adds a strong sense of dramatic tension to the interactions between the men in the dangerous, claustraphobic atmosphere of the cramped submarine. Mills and Portman also give good, realistic portrayals of men at war in this tense story. We don't have any reviews for We Dive at Dawn.